Unread/Reeder/and Pocket are first. These are all application that I use to read my RSS Feeds. I subscribe to many feeds, some legal related, others not. Unread and Reeder fetch the articles and organize them into the folder structure that I setup. I then use those apps to browse the articles, using Pocket to store any piece that I chose to save after my initial scan. Most often, articles I move into Pocket are for a specific purpose, whether for research or a blog post idea. Note: A great way to keep up with legal news is to sign up for law related RSS Feeds. I do this for a large number of legal resources and it works phenomenal. It keeps me fully up to date on the latest news and rulings. Todoist is up next. I am active in quite a few organizations, using the app to sort task into projects with prioritzation helps to keep me productive and up to date. Following the GTD method, I have a bucket list in my Notes app that I use to stash random ideas and tasks as the come to mind. Later, I organize them into their respective areas. I do this AT LEAST twice a week. (The philosophy behind the bucket list is that our brain is not meant to be used as a storage facility. Our brain works best when it is not bogged down with the task of trying to remember everything It is meant to focus on the task at hand with as much free mind as possible. The “dumping” of items in the bucket list and organizing later keeps the brain as light as possible. Drafts/Write/Byword/ As an attorney I am sure you can imagine that I write often. Thus, I use an array of writing apps. Drafts, for quickly beginning a note that I will throw away or develop further later. Write for outlining topics or materials covered during a presentation. Write offers an array of options for exporting and sharing your notes, so it works well for documenting those types of materials. Finally, Byword is my app of choice for writing long pieces. It syncs seamlessly with my iPad and Mac, and it offers focus modes that foster clear writing experiences. It’s awesome! Boxie (DropBox client) is a favorite also. Firms and businesses are only beginning to maximize the potential of tools such as Dropbox and Box. These resources can be used to host and share a large number of documents and files. Gone are the days of having to email yourself a document before you leave work so that you can work on it from home. Simply save it in Dropbox and it is available from anywhere. Also, premium features allow for versioning, which keeps not only the current version of the document but all previous versions as well. This permits one to easily revert to a previous version of a document if necessary. Evernote, last but not least. With Evernote the sky is the limit. I use Evernote to clip anything that I may need later. I often refer to it as an electronic file cabinet, but it offers so much more. Web pages, attachments, or photos added are all searchable within the app making everything easy to find. Evernote was used to share case files and documents in a number of different trials that I assisted. The only potential drawback of Evernote is the possibility of clutter. But with all of the organizing options they offer, your fate is totally up to you! Law.com by ALM is the primary app that I use to keep up with legal news and opinions. Of course, I have my misc legal subscriptions in my feeds, but one would be quite capable of using law.com alone to do the job. It’s a phenomenal resource and tool. Often allowing me to research an issue and store sources for later. The Fed Rules of Civil Procedure and Evidence applications are self explanatory. A practicing attorney can never have enough access to these rules. The app also permits for highlighting and making notes. WordPress to manage blogs and postings. This is tough. 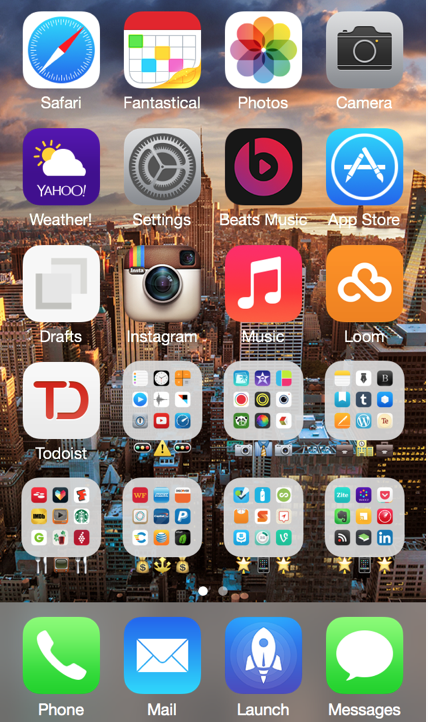 I use so many apps everyday, but if I had to pick one, it would be the Mail app. I have six different email addresses and I receive quite a few emails. I am big on “inbox zero,” so as emails arrive I archive, delete, flag, or file as needed. Emails requiring a response or some sort of future task are left in the inbox to remind me that there is something that needs to be done. Well, that is just about it. Thank you for reading. Stay tuned for future “Sweet Setups” and tips. Feel free to post any comments or questions that you may have. I would be pleased to address them. Great read. I know this is a critical extension of one’s workflow. I will give some of these apps a try.